It’s summer, and Emily and Sloane have plans. 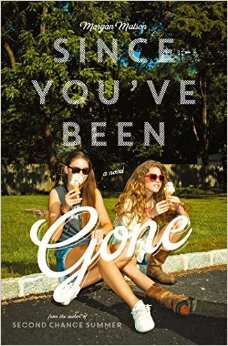 Except that Sloane and her family have disappeared, and Emily has no idea where to find her best friend. When she receives a to-do list of crazy things in the mail – a Sloane norm – she thinks this is a puzzle to help her find where Sloane has gone. But can she really do the things Sloane is asking for? Skinny-dip? Kiss a stranger? Steal something? Several years back, I read Second Chance Summer by Matson, and it ripped me apart. I didn’t know if this one would do the same, but I knew I wanted to read this latest from Matson. And while it didn’t rip me apart – it’s not the same kind of story, so it’s not really meant to – it was still excellently written. Funny thing: I went back and read my review of Summer before drafting this, and realized that while I’d loved the parts that ripped me up, I thought some of the other plot was carried out too long, so that I was mixed in my overall feeling for the book. I didn’t remember any of that negative part, and with this book, I didn’t feel there was anything dragged out. It was very well done. Have you heard of a MacGuffin? It’s a writing element that acts as an impetus for the story, but is fairly unimportant for the story itself. It’s a writing element that for a very long time, I had a hard time truly understanding. Since You’ve Been Gone, however, provides an excellent example of MacGuffin. Sloane is the MacGuffin. She’s the reason that Emily does everything in this book, the reason she grows and transforms over the summer, the reason she comes in contact with the people who become her friends. Sloane is the reason, but she’s pretty much absent in the book. She’s a memory, a compelling reason, a drive, but not actually a character. The story isn’t about Sloane. It’s about Emily. And my writer-self is absurdly pleased with that setup. I know. I’m a geek. One tiny negative about the book: While I liked the way it ended, I do wish we’d had a chance to resolve Emily’s up-in-the-air friendships with several characters. Everything falls apart at one point, as things are likely to do in these sorts of stories, and while some resolution is given with a few characters, the book ends before we find out what happens with the others. And as usual, it’s the love story that’s wrapped up, while the normal friendships are fairly relegated to the background. I really wanted to see how they resolved, if they resolved. Other than that, though, the book was excellent, and made for perfect summer afternoon reading. This entry was posted in 2015, Prose, Young Adult and tagged dream-invader. Bookmark the permalink.